Whether you ride a 49cc scooter or a new 599cc maxi scooter, our power sports team can help with insurance. If you have accessorized your bike like some of us have, then you be glad to know that we have coverage options for your upgrades. Just let us know about the upgrades in the questionnaire below and we can include them on your quote. Worried about a potential flat or running out of gas? Roadside assistance is available. 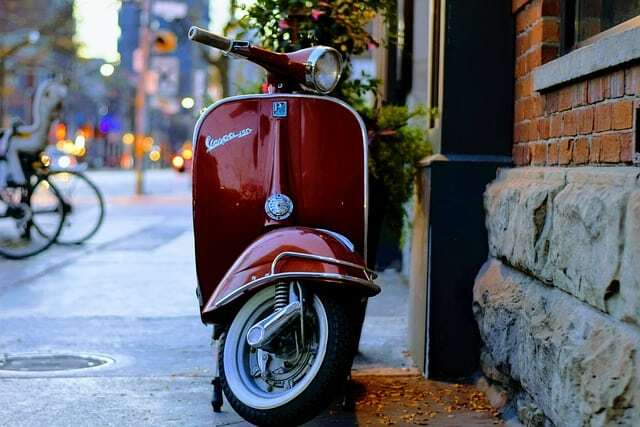 We can help with scooters from major manufacturers, such as Vespa, Aprilia, Honda, Suzuki, Yamaha, and more. Quotes are also available for Kymco and many other types of scooters. As of 2017, some of the people at our office are riding Yamaha Vinos and a BMW C650GT, but we’ve also owned Suzuki Burgmans and a Honda Silverwing. Do you have a separate mailing address? Many professions can earn discounts. Tell us what you do and we will work to find you a discount. How many years of motorcycle or ATV/UTV experience do you have? What is your spouse's name and birthdate? If you are married, we need to INCLUDE or EXCLUDE your spouse on the quote. This means that his or her name must be listed on the policy. This does not mean that it affects the price, but it is a requirement from most companies to list the spouse. Are you able to tell us what tickets or accidents you have in the last 3 years? If you know the type of ticket and/or the date, it helps us to get a more accurate quote. If you know your 17 digit VIN for a car (or other ID number for a golf cart/LSV), it helps us get an accurate quote. If you do not provide the VIN, then the quote is even more of an estimate. If you only provide the details of your street legal dune buggy, then we will not be able to send you a quote. Do you need to add any other riders? Remember, you must disclose all people of driving age in your household. Please tell us the NAME, Birthdate, and relationship to you of others riders that you are adding. Do you need to add another Motorcycle / ATV / UTV / Side By Side / Trike / Dune Buggy? If you have the VIN, please tell us here. If you are adding a second rider, please include a name and birthdate. Do you want to send us a picture of your ride? You can include it here. Do you authorize us to send you a text (SMS) about your quote or policy, if you purchase one?